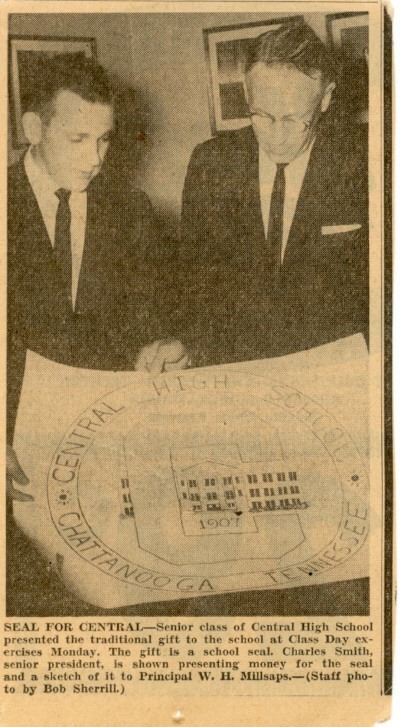 I was the President of the Class of ’61 (Charles Smith) and our senior class gift to the school was the school seal. Attached should be a newspaper photo of me presenting the seal to W. Holbart Millsaps. I have the original sketch shown in the photo along with the 2 other designs that were considered before we agreed on the final design – they are approx. 14″ by 14.” I also have the first embossed seal on paper from the hand seal that we had fabricated to use on stationery, official papers, etc. Some background: In the spring of 1961, the class officers had a meeting with Mr. Millsaps to discuss a class gift. He suggested that we could “present an official seal” which was needed on school communications. I thought that would be very easy since we were all busy with the end of school activities. All that we would need to do is get a copy of the seal and have a hand stamp fabricated. However, Mr. Millsaps informed us that the school did not have a seal, and we would have to design one. 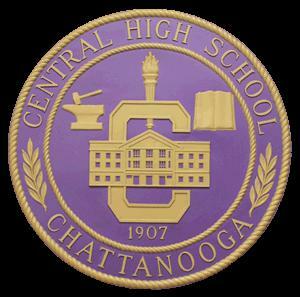 This initiated several months of activities to design the seal which is now used on most communications from Central. It includes the front of the building on Dodds Ave., “open book” representing knowledge, “torch” representing leadership, and “anvil” representing school spirit.